What's the world's most valuable brand, and why? Before answering these questions let me tell you a story. Some time ago we were on a Delta Airlines flight from Stuttgart, Germany to Atlanta, Georgia (en route to our final destination of Orlando, Florida). My seatmate on the Stuttgart-Atlanta segment worked for Coca-Cola and was returning home from the Middle East. It was in the familiar exchange, "what kind of work do you do," that we learned about the importance of "Coke Red." According to historical records, the original Coca-Cola recipe was formulated at the Eagle Drug and Chemical Company, a drugstore in Columbus, Georgia. The person responsible for this creation was John Pemberton. The first sales were at Jacob's Pharmacy in Atlanta, Georgia on May 8, 1886. Sold initially as a patent medicine for five cents, the soda became popular at the time due to the belief that the carbonated water was good for one's health. An advertisement, the first, appeared that same year in the Atlanta Journal. Coca-Cola was first sold in bottles by Asa G. Candler & Co. at its pharmacy location. Large bottles of Coke were sold by druggists and grocers for 25 cents each. The original bottles were from the Biedenharn Candy Company, Vicksburg, Mississippi in 1891. 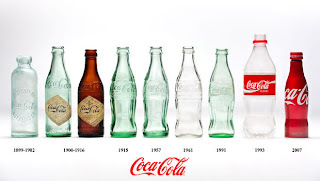 The Biedenharn bottle preceded the "hobble-skirt" design created in 1915 which has since become the main brand or identity of the principal Coca-Cola products of Coke and Diet Coke. A bottle design contest in 1915 was won by Earl R. Dean of the Root Glass Company in Terre Haute, Indiana. It's reported that the designers were inspired by the cocoa bean and transplanted its vertical grooves to the glass. Add to the Georgia-Green tinted bottle (used until 1956) the Spencerian Coca-Cola script and the result was a distinctive product: "recognizable by component parts, even if broken; a shape that could be identified by touch in the dark; or when submerged in a bucket of ice." This particular bottle design became a registered trademark in 1960. When did cans of Coke first appear? In 1955. The familiar Coca-Cola Red is an integral component of the classic design. The white cursive text set on a bright red background--or the reverse of white background and red lettering has become ubiquitous in 200 countries. While there are estimated to be around 290 visibly different shades of red, there is only one Coke Red. In an article posted by Brandcreation we read that by walking around with a spectrophotometer one can measure Pantone 185 or Pantone 485 or RGB 235, 45, 46 or RGB 218, 37, 29 or CMYK 0, 100, 100, 0 and more. "That’s a result of inconsistent industrial and differing production standards. According to a record at the United States Patent and Trademark Office there is a ‘Coke Red’ defined as Pantone 484," the author stated. Coca-Cola Red also has a long-standing connection with Santa Claus. "Jolly Old St. Nicholas" has been featured in its advertisements since the 1920s, according to the official Coca-Cola website. In the early 2000s, it was reported that Coca-Cola print buyers, with the aid of color management techniques, had reduced the color appearances of their Coke Red from 20,000 to "only" 2,000 variations. Thus the conversation with my seatmate from Coke headquarters. This global marketing manager, along with others, was assigned the task of auditing print and packaging colors in different parts of the world belonging to the Coca-Cola brand. To do this the official Coke Red was loaded into a spectrophotometer which was used to scan print packaging and advertising. This may be how the company was able to eliminate almost 18,000 variations of red. Okay, you knew the answer to the first part of the question--that Coca-Cola is the world's most valuable brand. Under the four-year leadership of CEO Muhtar Kent the company has improved profits and is once again the No. 1 soft drink in the USA taking the title away from Pepsi. Coca-Cola had 2012 revenue of $48 billion. The positive metrics come in spite of a continued decline in sales of carbonated beverages in its home market. Last year Interbrand declared Coke to be the world's most valuable brand worth $77.8 billion. It starts at the top. 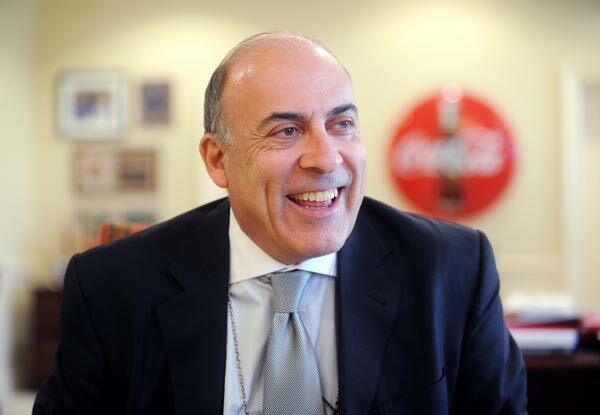 Historically Coca-Cola leadership has paid attention to its brand. 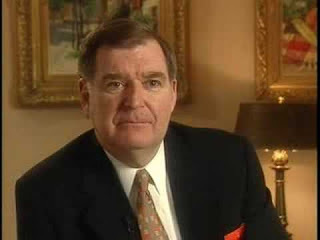 The assignment to get the official Coke Red under better management more than a decade ago came from a future CEO, Douglas Ivester, who was at the time president and COO. He confirmed the Coke Red story to me at a luncheon in Central Florida. Although his term in office was short-lived, about 2 years, Ivester was a stickler for detail. And for Coke the color red is no small matter. It represents in large part who the company is. Executives, along with corporate boards, are guardians of everything the company stands for. Day-to-day responsibilities for brand management may be delegated appropriately within the organization but are owned at the top. The brand is protected. Legally and in every other way. The name and reputation of the business needs protecting. For Coca-Cola this includes copyright, the "secret formula," quality controls, product development, marketing, and succession. That protection extends to carefully screening those who are allowed to be "officially" associated with the brands in advertising and promotions. The brand and reputation match. What you say about your products and services is one thing. What your customers and others say is quite another. Social media gives voice (mostly anecdotal) to how people feel about their interactions with brands and employees. The goal is "brand integrity" with reputation and reality matching in a positive way. Coca-Cola had a rough time when in 1985 under CEO Roberto Goizueta it tried to change the formula for regular Coke (before the Internet was commercialized). The research was flawed. It's true that New Coke tasted sweeter than old Coke. However, consumers pushed back having had a long-term relationship with a product that was more than a soft drink. It was a friend of the family. There was an emotional attachment to Coca-Cola, something the taste tests failed to uncover and weren't designed to do. The company acknowledged the mistake and did away with New Coke. As was reported in The Economist in 1999, "The world's most famous consumer brand became embroiled in its worst-ever health scare, when around 100 people in Belgium, many of them children, and 88 people in France suffered nausea, headaches and diarrhoea, some of them seriously enough to be admitted to hospital.....Coca-Cola seemingly forgot the cardinal rule of crisis management—to act fast, tell the whole truth and look as if you have nothing to hide." The problems under Mr. Ivester caused a loss of confidence with the Coca-Cola Board of Directors. He resigned in 2000 as CEO after 24 months on the job. New Coke. Late response to European crisis. Failed acquisitions. Errors in corporate judgment. All organizations face serious challenges at different times. Owning up to wrong decisions, especially those of great magnitude, and correcting them, is how leaders build credibility among their brands, shareholders, employees, media--and especially customers who make everything possible. "Coca-Cola," "Coke," the "Coca-Cola Contour Bottle," and "Coke Red" are registered trademarks of The Coca-Cola Company. Images are from Google and may be copyrighted.